The Rider destroyed me when I saw it, and then again when I tried talking about it with friends after, and then again when I saw it a second time. 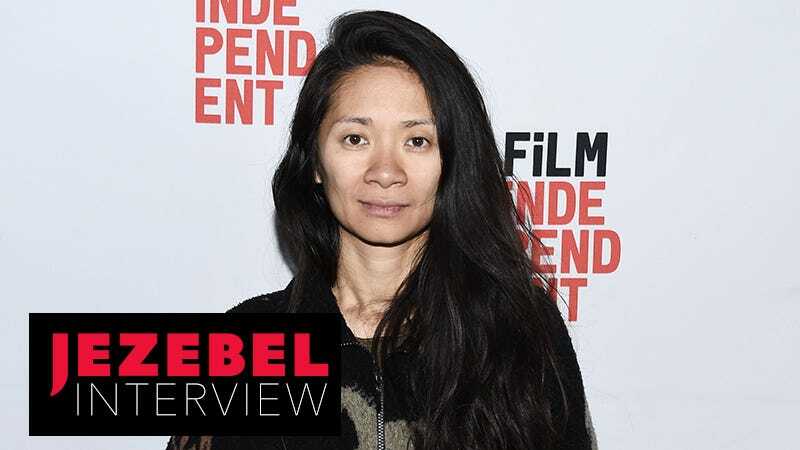 Chloé Zhao’s narrative blend of real life and fiction focuses on a group of Lakota cowboys—many of whom play themselves—living on the Pine Ridge Reservation in South Dakota. Protagonist Brady Blackburn’s story is loosely based on that of the actor who plays him, Brady Jandreau. Both Bradys are gifted at training horses, and were real-life rodeo riders until a horse fractured his skull during a competition, putting him in a three-day coma. Though I later discovered it was not designed as a message movie, The Rider is a portrait of a man reconciling his traditional conception of masculinity with his survival. It’s about him unlearning things he thought he needed to do to be a man, so that he can continue being a man. Particularly devastating are the scenes featuring hospital visits with Lane Scott, a rider friend of Brady’s, whose own rodeo accident left him paralyzed and unable to speak. Jandreau’s own family—his father Tim Jandreau and sister Lilly Jandreau—also play versions of themselves. Zhao initially met the cowboys her movie portrays while shooting her similarly liminal debut film, Songs My Brother Taught Me, also on Pine Ridge. I spoke to Zhao this week about The Rider, her second feature, her philosophy about blending fact and fiction, and her movie-long interrogation of masculinity. An edited and condensed transcript of our chat is below. JEZEBEL: Your movie made me cry so hard that I was embarrassed to leave the screening room. Do you find that you’re often provoking this kind of reaction? CHLOÉ ZHAO: Men between 30 to 50, 60 are the ones who cry the most at this movie, which is crazy. Women cry from time to time, but men, yes. I think there’s maybe a little space in this movie that allows them to be in touch with a vulnerable side of them. There’s not usually a lot in our popular culture that allows them to express themselves. I’m sure in New York you can express yourself, however, but seeing someone [who’s] supposed to be that tough be so vulnerable is something that men can relate to. I’m out there to get you, guys! I read the background about how you came to make this movie. Were you interested in interrogating masculinity to the degree that you ended up doing before you went into it? Never thought about it. I read [that] in a review, I loved it, I started talking about it like that. So you weren’t even thinking about that when making the movie? No. There was no desire for or statement about issues. I was just hiding out. I knew I wanted to make another film on the reservation. I knew I wanted to meet someone who could carry a movie really deep, not wide like my first film, but deep with a personal story. Just hiding out, and [Brady] walked in. I saw his face, and I saw him training horses and I thought, “Oh wow, I think this kid can act.” I spoke to him, and that’s how it started. I had nothing to say except I want to have a connection to somebody for them to be in my movie. I think that’s where I like to start. Just by pointing the camera these days, you already have so many labels popping up in our mind when we look at an image. So to start on the personal connection made me feel safe that I’m making a universal, human story before coming in with an agenda. That you didn’t have an agenda makes it even more impressive that this movie coincides with the cultural moment of interrogating masculinity and rethinking what “being a man” even is. It’s good for women, and it’s also good for men. If I have boys, I want my child to be able to cry if he loses a game or doesn’t achieve his dreams. If he is the superhero that doesn’t get his power back. He can still be a hero, he can still be a man. It’s a tough world for men to live in. It’s tough for women, but it’s tough for men, too. I’ve never seen this emotional of a cowboy/Western movie. Do you think such an emotional take speaks to your own sensibility or, again, is it just happenstance? I’ve seen two Westerns before The Rider. I’ve seen four now. Even meeting [the cowboys in the film], I didn’t think, “Oh, this is a Western.” I’m Chinese, so even though I made film on the reservation, I don’t carry that heaviness with cowboys and Indians and all the tragedy and violence. I don’t carry it with me; I know it intellectually. So when I meet these people, they’re just people. Brady, when I first met him, he’s wearing a cowboy scarf, he has a feather in his hat, he’s in the same outfit he is in the movie. It’s not me dressing him that way, which means Western identity is still very strong in the heartland and you really see it. By being true to the reality, it’s going to come off as a Western. Fusing a documentary sensibility with narrative is a clever way of getting at certain truths. What is your overall philosophy about objectivity or portraying reality? Even though people think Brady is acting like himself [in the movie], if you meet Brady, he’s very talkative, very loud, and funny. He’s nothing like he is in the movie, where he’s acting like Brady Blackburn. But 60 percent of the facts—where he lives, what he does for a living, who’s his dad—are true. He’s always acting in a story inspired by his real life. If I really wanted him to play himself, objectively, that’s not going to be the character you see. I find parallels in the way [Terrence] Malick works. He asks his actors to bring who they are, so much more than so much other directors. I think there’s such a confusing layer with Brady: It’s inspired by him, but he’s acting as somebody else, and I still gave him enough space to move and interact so that there’s some part of who he is also coming to Brady Blackburn. That’s not going to be very different when I work with professional actors in the future. So I’m pretty much in that Malick school. I want to make fiction, but I want to have authentic human interactions because that emotional truth between people is the real truth beyond the factual truth of what I’m trying to convey. And to capture that, you have to make films a certain way. You need enough space for freedom for the actors. Emotional truth between people is the real truth beyond the factual truth of what I’m trying to convey. But then you have people in your movie, like Brady’s sister Lilly, who’s on the autism spectrum, and Lane Scott, who is paralyzed and unable to speak after his own rodeo accident. For those, there seems to be little-to-no division between who they are and what’s onscreen. A couple cowboys, too. They don’t need to. This is a conversation, too: Do you want to be yourself? My story doesn’t need them to be someone else. If you are working with someone like Lilly, who has autism, and you want them to do exactly what you need them to do to get the plot to move forward, then you have to cast an actor who can play someone with autism. That’s not the situation we were in. For me, the writing process is also to write a story where, when you have someone like Lilly involved, she’s there for an emotional reason as opposed to a plot[-oriented] reason, so that she can express herself in different ways. Who she is, is going to be enough for the story. Same with Lane, although Lane played funnier than I initially had him in the script. He cracked jokes with Brady. Some of the jokes he had—“Rub some dirt in [your head wound]”—that’s Lane improvising. I just wrote a couple of lines and he started bantering. Well, the situation isn’t improvised. The situation is set up, and then Lil, she knows we’re making a film. If I told her I wanted her to comfort Brady, “It’s okay, it’s okay,” [about the rodeo], she would say, “Well, it’s still an A through Z adventure.” She knows what I want, but she’s going to say it how she wants to say it. If sixty percent of Brady’s character is himself, would certain resentments come to surface when you’d have him arguing with his father (played by his real-life father) about, say, quitting riding? Each scene has a different degree and I set it up for that reason. Yes, his dad did tell him not to go [the day of his accident]. They knew that horse was a difficult horse. Yes, I knew that they did argue, and yes, he did have injuries. But that situation was staged, and in real life Brady would have said something very different to his dad than just sitting there and not talking. He wouldn’t just sit there and take it. But there are these tiny little things, even just a flicker in the eye, and a choice of a posture that has a history behind it, that will be there. Do you think your next projects will be similar in style, in terms of meshing reality and fiction? Out of the four projects I’m working on, three of them are either set in the 1800s or 3,000 years in the future. So if they’re dead or not born yet, I can’t cast actors that are discoveries. But I do think that there’s a way to sneak some of that in there so that these kinds of stories can be told differently.